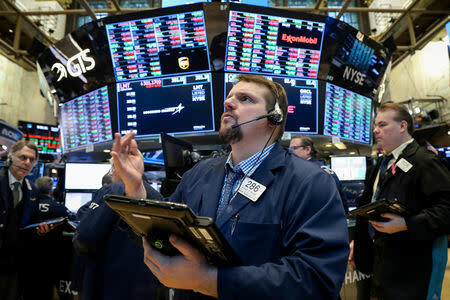 NEW YORK (Reuters) - U.S. stocks rose on Friday, led by technology companies, as a report on progress in U.S.-China trade talks lifted sentiment, pushing the S&P 500 to its best week since November. China's state-run Xinhua news agency said Washington and Beijing were making substantive progress on trade talks, providing relief after news that a summit to seal a deal between the two sides would not happen at March-end. Despite the mixed news recently on the trade front, many investors expect a deal will eventually happen, said Paul Nolte, portfolio manager at Kingsview Asset Management in Chicago. In addition, he said, "Investors are warming up to the idea that central banks have taken a huge step backward in terms of tightening." U.S. data showed manufacturing output fell for a second straight month in February and factory activity in New York state was weaker than expected this month. That followed a batch of weak data this week that lent support to the Federal Reserve's dovish stance on future interest rate hikes, which has helped to lift stocks this year. Boeing Co closed up 1.5 percent, lifting the Dow, after the world's largest planemaker said a software upgrade for the 737 MAX aircraft will be rolled out in the coming weeks. Even so, Boeing's shares for the week lost 10.3 percent. The company's 737 MAX jets were grounded globally following a fatal crash involving one of its planes in Ethiopia on Sunday. Broadcom Inc jumped 8.2 percent and was among the biggest boosts to the S&P 500 and Nasdaq, after the company late on Thursday reported a quarterly profit that beat analysts' estimates. Photoshop maker Adobe Inc, which also reported results late Thursday, fell 4 percent after its current-quarter revenue forecast missed analysts' estimates. The stock briefly added to losses and Google-parent Alphabet lost ground after the Washington Post reported that U.S. state attorneys general are signaling they are willing to take action against those and other companies. Qualcomm shares climbed 2.2 percent after it won a legal victory against Apple Inc, with a jury in federal court in San Diego finding that Apple owes Qualcomm about $31 million for infringing three of its patents. Advancing issues outnumbered declining ones on the NYSE by a 1.63-to-1 ratio; on Nasdaq, a 1.54-to-1 ratio favored advancers. The S&P 500 posted 61 new 52-week highs and no new lows; the Nasdaq Composite recorded 92 new highs and 41 new lows. Volume on U.S. exchanges was 10.8 billion shares, compared to the 7.5 billion average for the full session over the last 20 trading days.